Coming to Paris was pure indulgence on my part. Most people think of these kinds of things months, or even years in advance. My adventure was thought out and only confirmed weeks in advance. It didn’t give me a lot of time to research the food scene, but it did give me enough time to realize that I didn’t want my trip to be about spending a lot of time in hoity toity stuffy restaurants where I’d be so concerned about committing a Parisian faux pas that I wouldn’t enjoy my dining experience. So that pretty much ruled out any of the BIG name destinations that “foodies” would recommend. I also couldn’t justify the prices that some of these places were charging. Call me spoiled, but after eating the perfect meal at The French Laundry and knowing what the bill was, I couldn’t imagine that double the cost in a Parisian 3*, 2* or even 1* would deliver double the pleasure. But there’s a movement in France away from traditional, lavish and often unapproachable dining and it’s got a name… Bistronomy. It’s about young cooks who may or may not be classically trained but who have all spent time in Michelin starred kitchens have gone out on their own and are revelling in their freedom to veer away from the conventional to create very good food at a more affordable price. Daniel Rose, the 33 year-old American-born chef at Spring restaurant is almost always mentioned whenever the term Bistronomy comes up. His 22 seat restaurant is a tough place to get in to, but luck would have it they are trying out a new online lunch reservation system and I jumped on it! At €42/person ($60) for a 3 course meal without drinks, this was a splurge. But compared to the Michelin starred world of dining, this menu is a steal. 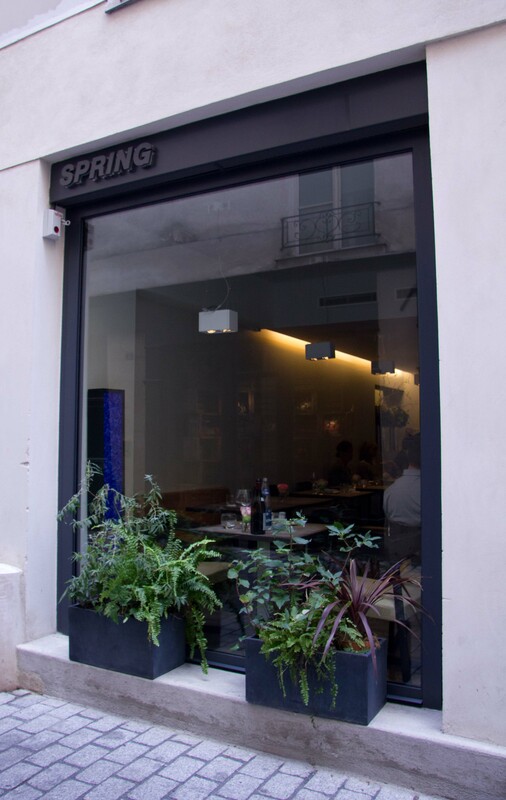 Spring is located down a small street nestled between Les Halles and the Louvre. 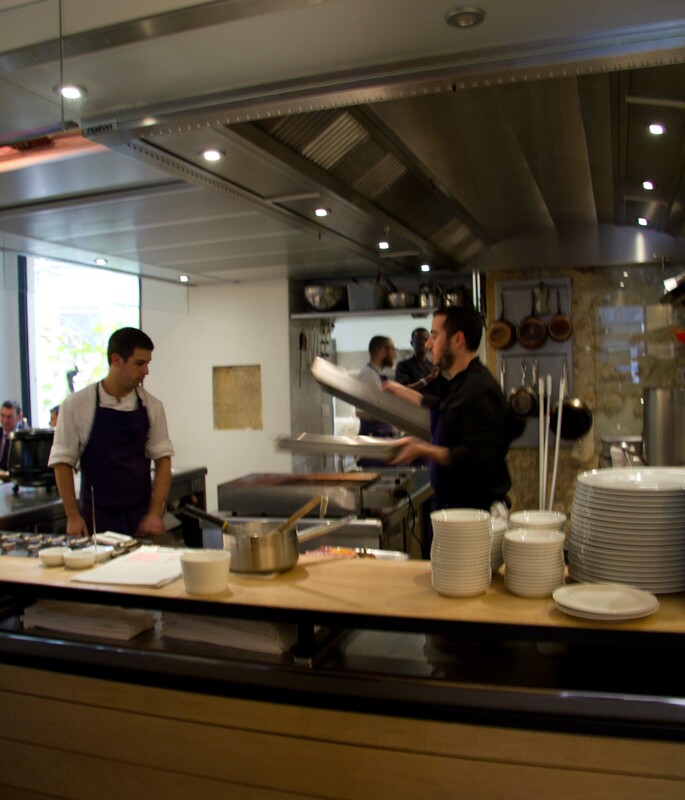 I loved the open kitchen which takes up almost as much room as the seating area of the restaurant. Our table had a great view of the action in the kitchen where Chef Rose communicated with his staff in English and French. Sitting down, I immediately knew that I was in for a treat and relaxed into a special meal with a lovely glass of Champagne. Such a pleasure to see Chef Rose (in black) actually in the kitchen, something you rarely find these days in big name Michelin starred establishments. The menu changes daily as Rose feels that he doesn’t see a point of going to work if he has to cook the same thing every day. We weren’t even given a menu, which meant that we were in the sommelier’s hands when it came to wine choices but her recommendations were bang on. We were offered 3 first tastes, all simple but I saw it as showing confidence in showcasing stellar ingredients. 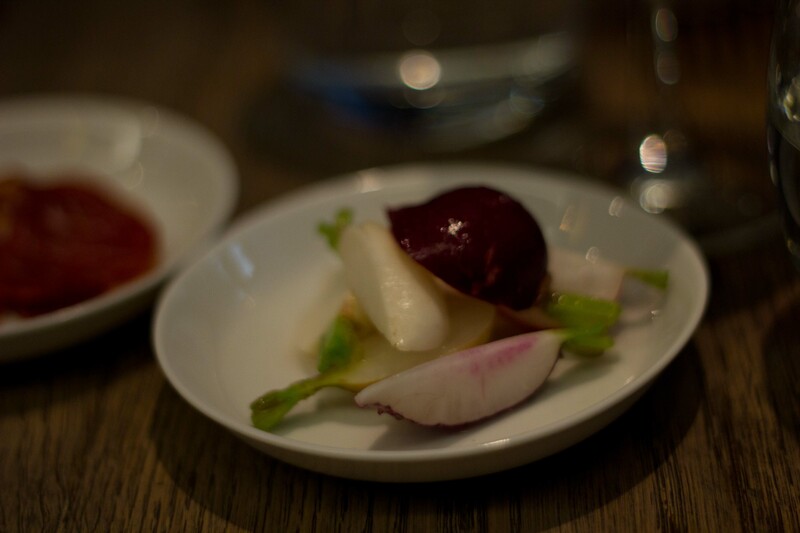 Lightly salted crisp radishes served with sweet butter. Something I’ve read about a lot in French blogs, but not something I completely understood until I tried it. Definitely an unusual combination to my North American tastes, but very good nonetheless. 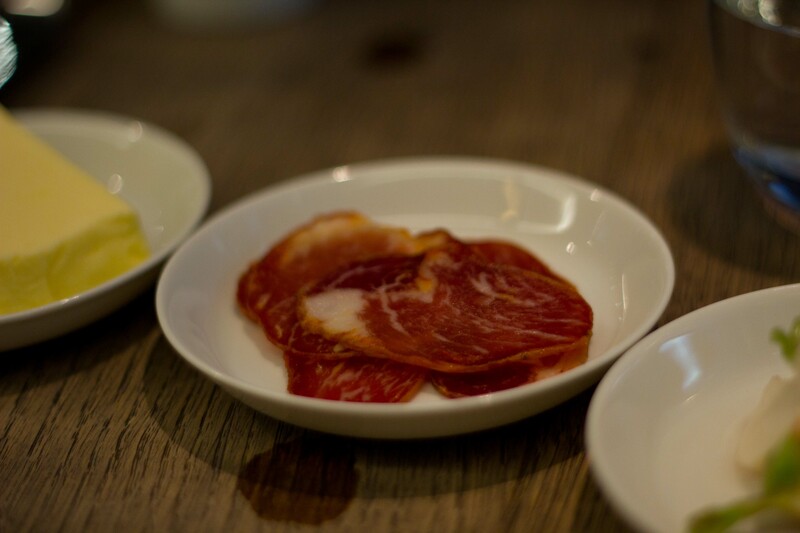 Saucisson – who doesn’t love cured meat? 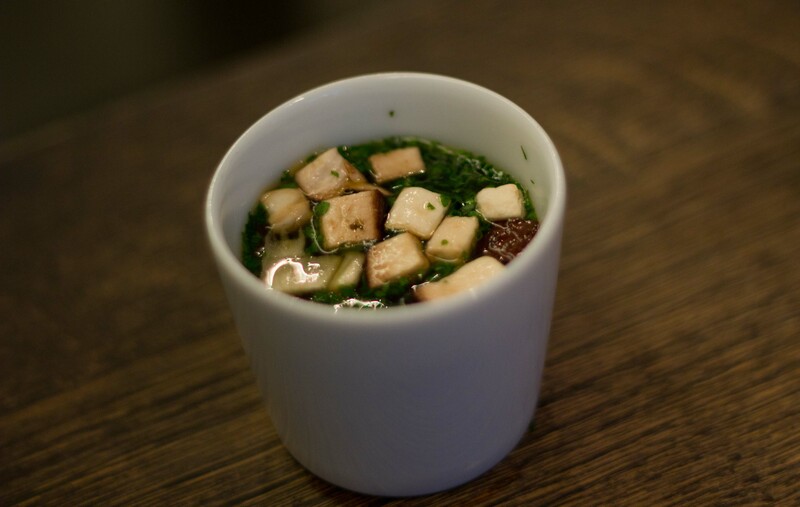 “Simple” chicken broth with shitake mushrooms and chevril. 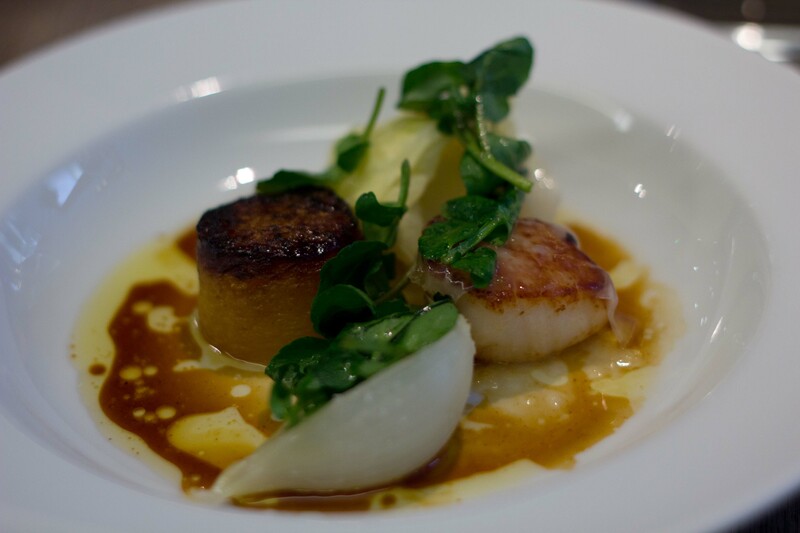 Seared scallop sits next to a seared round of squash with sweet onion and cabbage. I was very excited to be served pigeon as it was another food on my list that I really wanted to try in Paris but hadn’t gotten around to it yet. 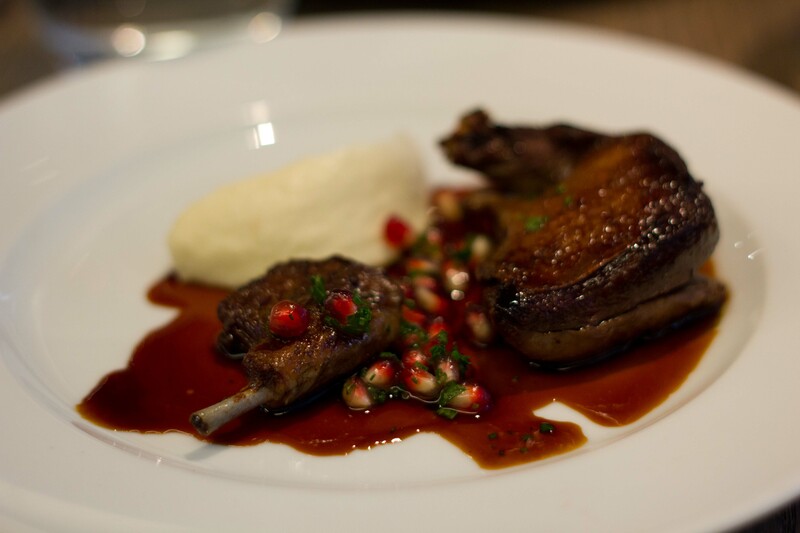 While the pigeon was tender with flavourful dark meat, it was the almond puree that stole the show on this dish. Was it a tart? A pie? 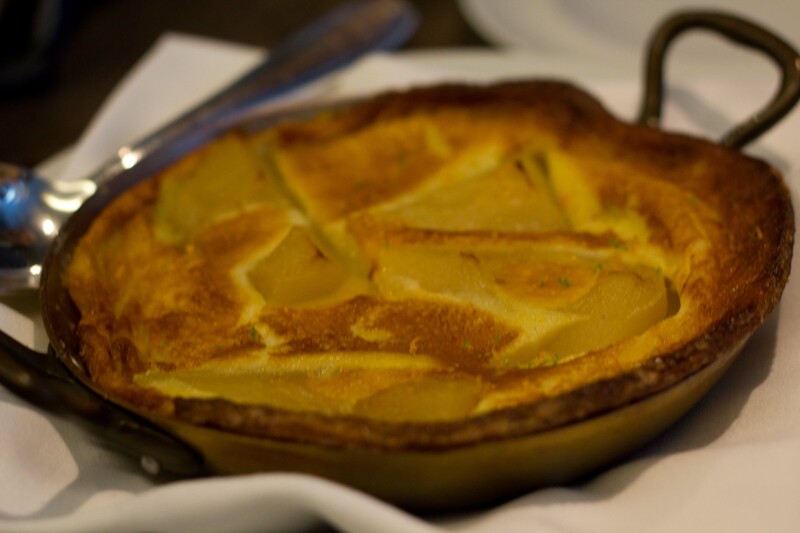 No, it’s pear clafoutis! Baked pears surrounded by a light batter. A comforting dessert that made me happy to be in Paris in the Fall. 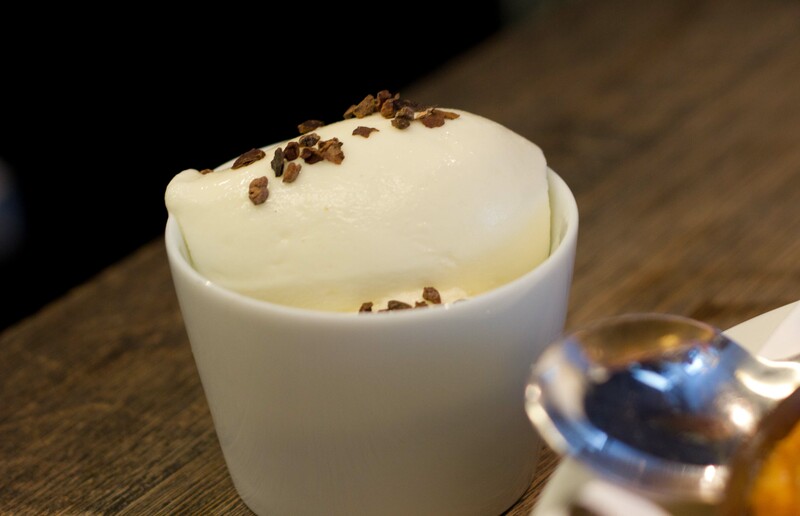 The yogurt sorbet with cracked cocoa nibs on top was shockingly tart and added brightness to the pear clafoutis. 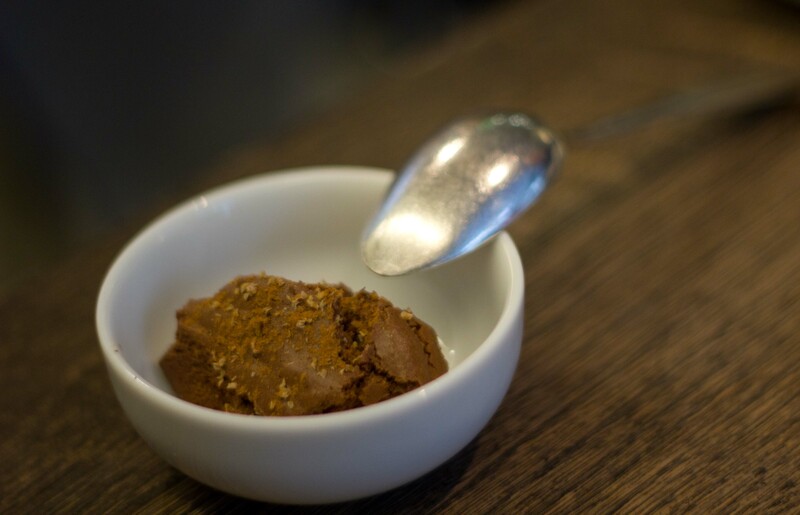 I was pretty full by the time this wicked Chocolate mousse appeared, but kept saying “just one more bite”, until this little scoop disappeared. 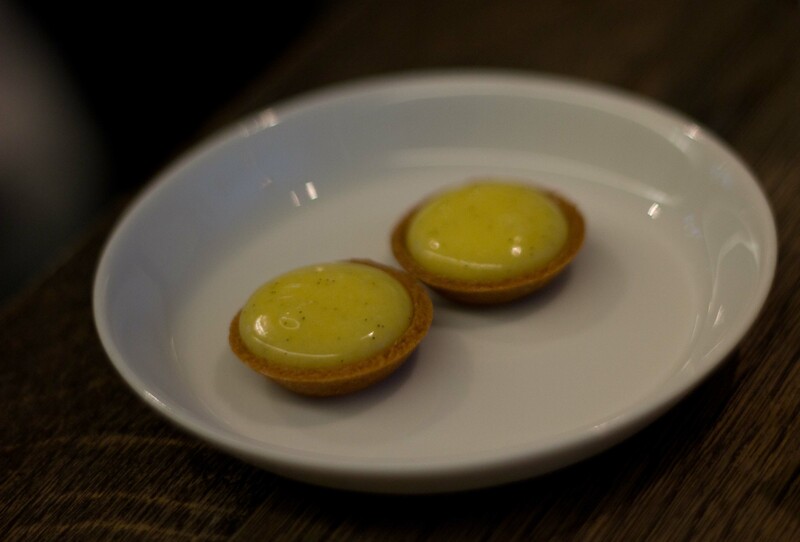 Tiny lemon tarts added a bright finish to this wonderful meal. The thoughtful playfulness put into every dish from start to end was a great example of why bistronomy is leading the way in French dining today. Great write up Susy. We found excellent cuisine in all the cities we visited in France. Perhaps something for your further travels. Cheers! Thanks Gary! I’d love to spend more time in France and hopefully it’s in the cards soon. If/when I do, I’ll be sure to ask for advice!